Is your service available nationwide? What are the primary services performed? What if I don’t know the grave number? When will the services be performed? Do you provide fresh cut flowers, bulbs and plants? Do you provide restoration services? How will I know that the services have been completed? Our services are available across mainland UK. Most cemeteries and churchyards offer little more than the mowing of lawns around graves, and rough edging. They do not have the resources to trim and inspect each individual memorial. 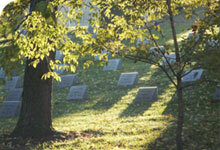 The ultimate responsibility for maintaining the grave rests with the family and friends not with the cemetery, since the families purchase the gravesite for their loved ones. Each visit by one of our specialist grave carers includes the following general maintenance: Trimming of grass around headstone, edging of plot, removal of weeds, removal of all debris (old flowers, plants and other litter), washing of memorial pot liners, cleaning of headstone/memorial. We will also document the monument condition and recommend measures that may be needed to protect the monument long-term. You may print out the order form and post it to us. Alternatively, you can call us to request an information pack which we will post to you. If you can provide us with the grave location number, we can easily find the location. But don’t worry if you don’t have this, we can locate it for you for a one off fee of just £25. We will schedule the work once we receive your order. We do require at least ten working days before we can make our first visit to the grave. Therefore, if you choose our SeasonCare Plus or MonthlyCare packages, we will endeavour to fulfil any special day visits, but these cannot be guaranteed, if they fall within these first ten days. All grave tendings are undertaken Monday to Friday. If you choose our SeasonCare Plus or MonthlyCare package, tending will be completed no more than two days before your chosen date. We offer a large selection of bulbs, plants and flowers depending on the season. Our specialist grave carers will choose what is most appropriate for your grave, based on the time of year, its type, size and location, and any personal preference that you may have from our selections (depending on availability). All of our selections have been carefully chosen based on the appropriateness for UK cemeteries and churchyards. If we believe that the memorial or kerb edging requires some repairs and/or additional maintenance, we will provide you with detailed photographs and a written report. We can also provide you with a ‘no obligation’ quotation on any work that needs completing at subsequent visits, including the replacement of old or ‘lost’ grave vases, the renewal of stone/pebble/slate chippings, or any turfing or topsoil work. A specialist monumental mason would carry out any repairs that may be necessary to the memorial or the inscription. We will notify you by email and provide a photograph as proof that work has been completed. At Guardian GraveCare, incomplete service is unacceptable. If you are not pleased for any reason, please contact us and we will correct the issue. Please understand that occasionally the condition of the grave may be correctable only as a major restoration project.